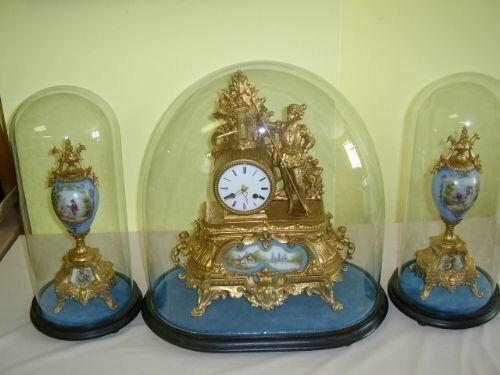 A magnificent French Garniture Clock Set under original glass domes standing on dralon lined wooden platforms. The bodies of the garnitures are all hand painted as is the main central landscape painted plaque. 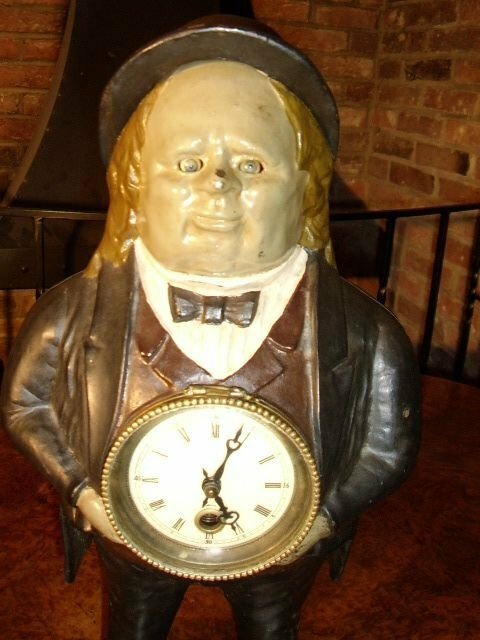 The clock has a delicate chime on the half hour and hour,having a bell ring and being an eight day. The movement is a silk suspension and has a Paris stamp,being manufactured by Japy Freres. 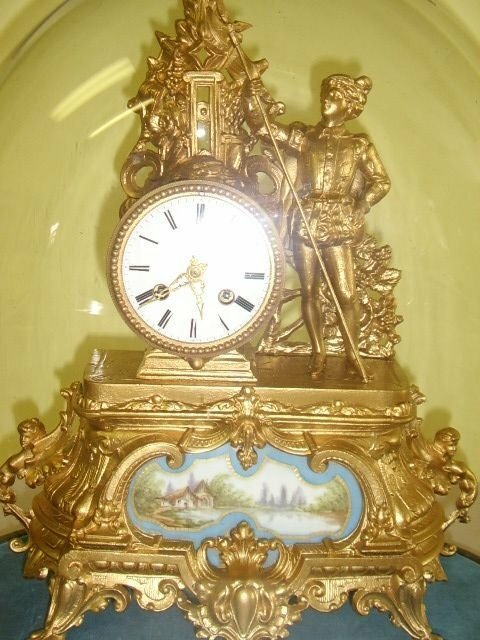 This set has been re-gilded many years ago and still shows a tremendous amount of detail in the cast body of the clock. There is no obvious damage and the overall condition and appearance is excellent for its age. The approximate Measurements are Main Dome Height 14 Inches.The two matching Garnitures are slighty less at approx. 13 Inches each. These measurements are with the bases included. 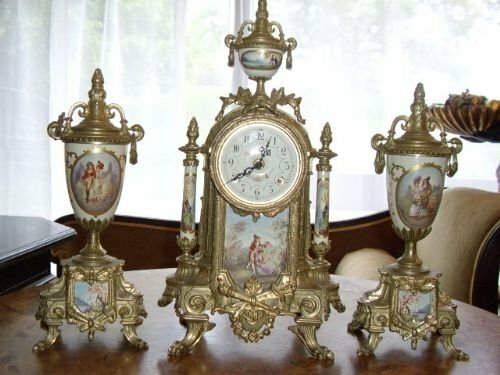 The Width of the main clock at its base is quite deep measuring approx.8 Inches.This Set would therefore fit easily on a sidetable or a grand mantlepiece. 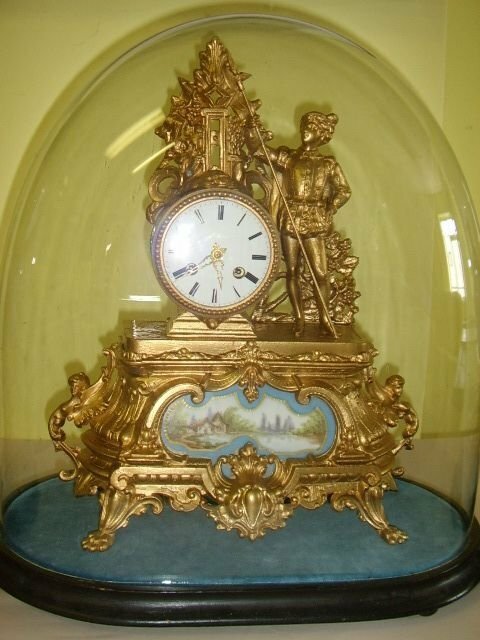 DUE TO THE FRAGILE NATURE OF THE GLASS DOMES,DELIVERY BY US OR COLLECTION IN PERSON WOULD BE A REQUIREMENT. 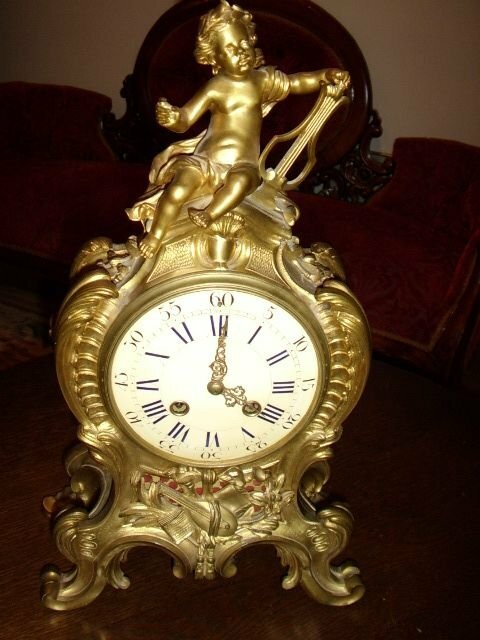 A fine example of a Louis Style Mantle Clock with painted roman numerals on a enamelled face. 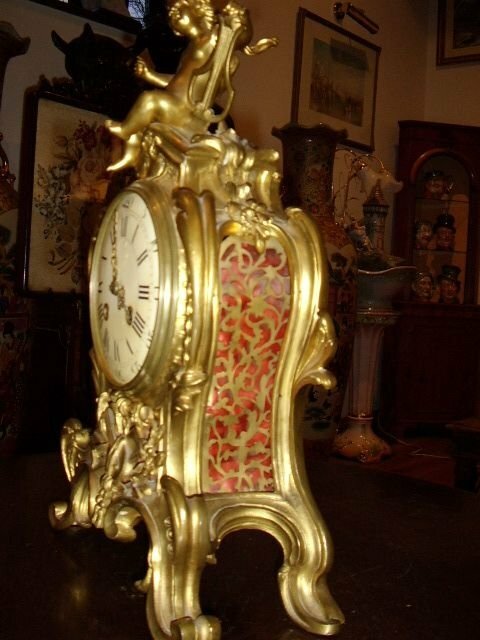 The main case is an elaborate design of scrollwork manufactured in bronze with a gilt ormolu finish. The side panels of the clock are trimmed with a pieced design of fretworked brass sheeting behind which is a red silk lining material. 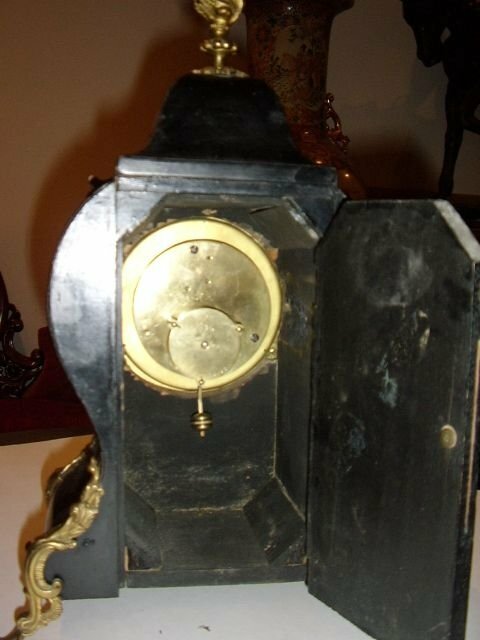 The rear of the clock is accessable via a glass beval cut opening inspection door. The movement is stamped G.V.which are the initials for top maker Gay Vicarino & Co of Paris. There is a swinging brass weighted pendulum inside the movement,which is an eight day striker on the half hour and hour,ringing a bell. 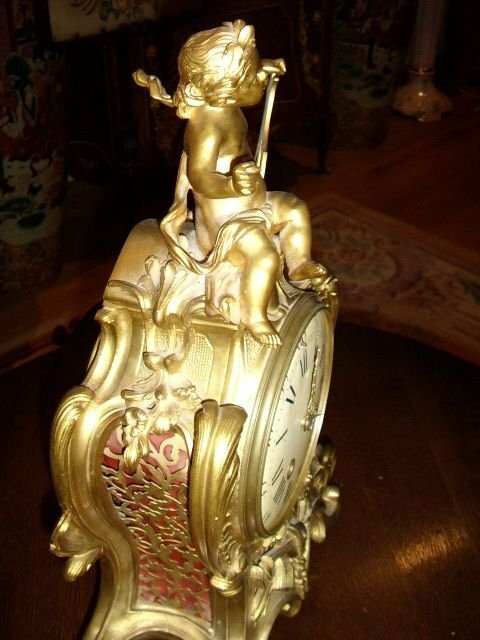 The theme of the clock is a lovely cherub sitting on top playing an harp. 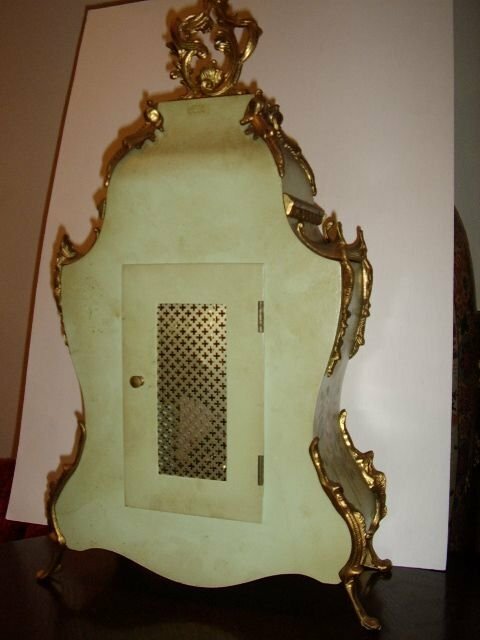 The overall decorative case is in good condition. A fine French Boule Bracket Clock inlaid with brass & tortoise shell.The clock face consists of porcelain roman numerals. 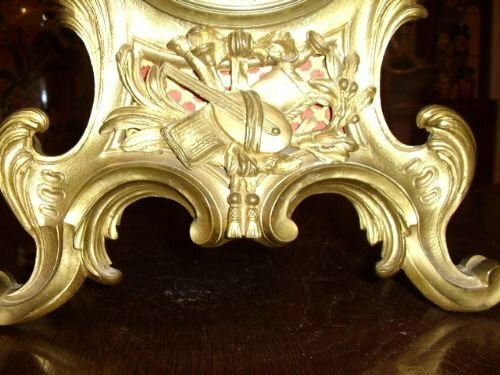 There are ormoluu decorative mounts throughout the front of the clock which are attached to the feet.There is a turned finule on top. 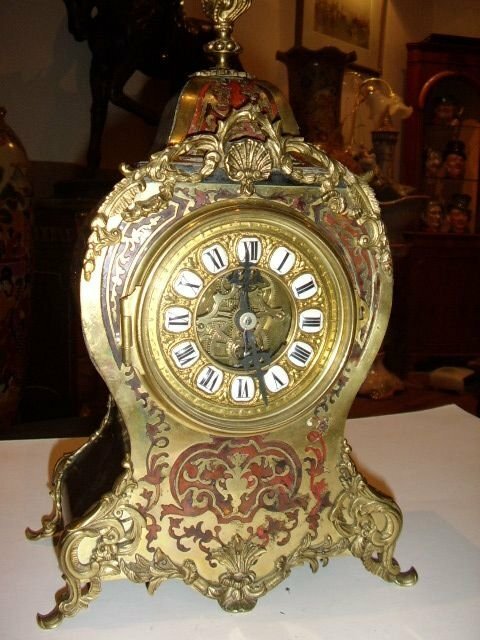 The sides and back of the clock case are simply made from thin wood ply which has been ebonised or painted black. 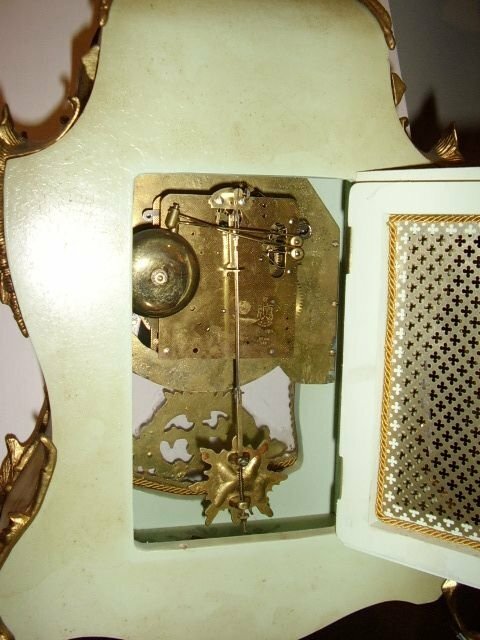 The mechanism has a pendulum with a weight attached on a fixed brass rod, acting as a counter weight, coming out of the movement to make the clock tick.It cannot stop or go off beat like a clock with a swinging or detachable pendulum. 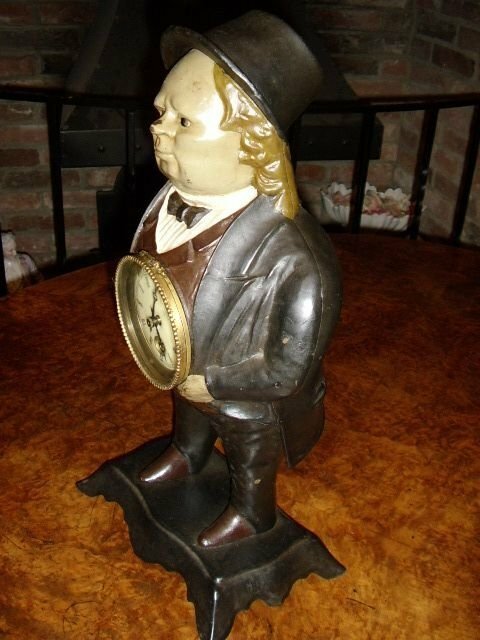 Measurements are 15 Inches in Height x 9 Inches in Width,and the Depth is 5 Inches. 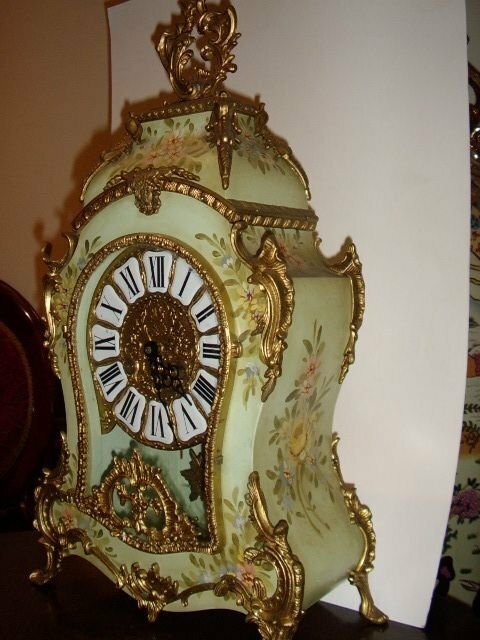 These clock are simple in construction and elaborate in style.They are getting harder to find. 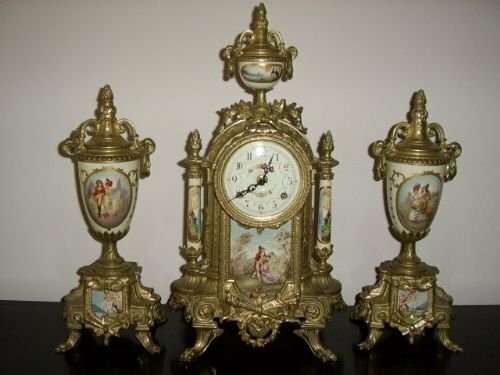 ORMOLU CLOCK SET WITH PAINTED PORCELAIN PANELS & GARNITURES. ORMOLU CLOCK SET WITH MATCHING PAIR OF GARNITURES INSET WITH PORCELAIN PANELS. 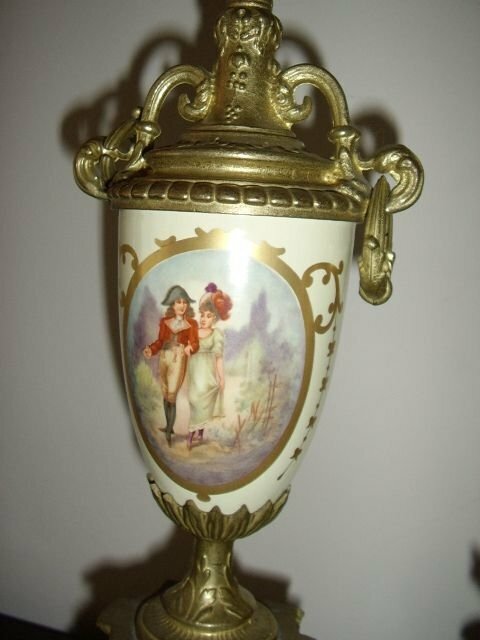 The three piece set is solid gilt cast brass with good detail and has cameos on porcelain with painted gold decoration. 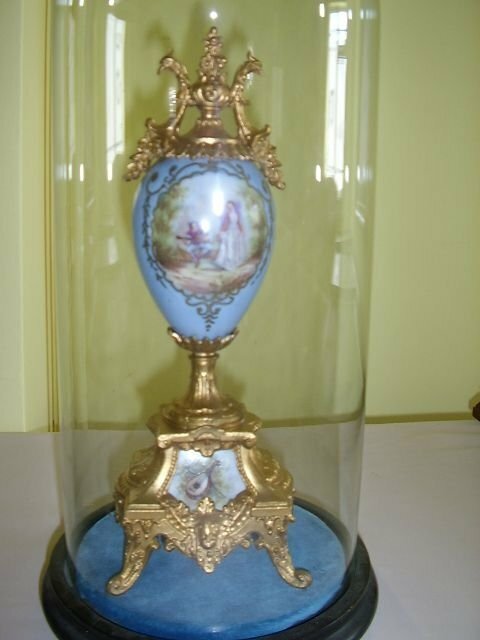 The porcelain cameos depict 17th Century scenes. The movement is a wind up 7 day system and has a delicate bell chime on the hour and half hour. 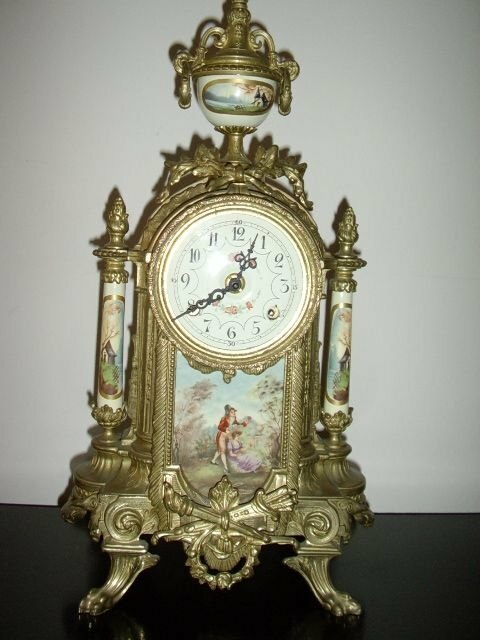 Condition is very good as this clock set is a later modern copy of an earlier French set. Glass is missing from face. 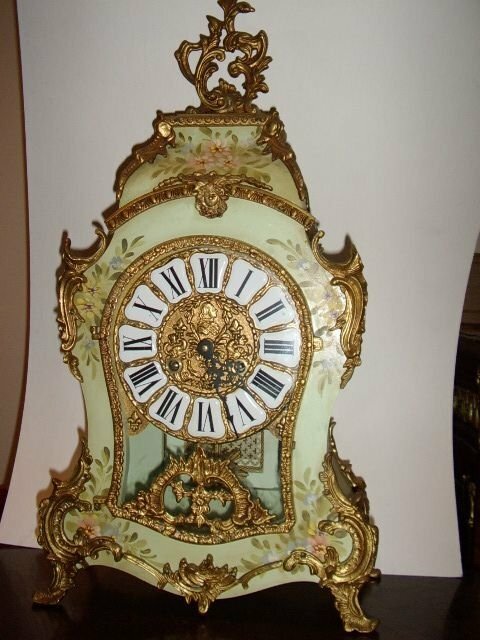 FRENCH LOUIS STYLE ORMOLU BRACKET CLOCK (Twin Bell Ringing Copy ) PAINTED CASE WITH PORCELAIN ROMAN NUMERALS. 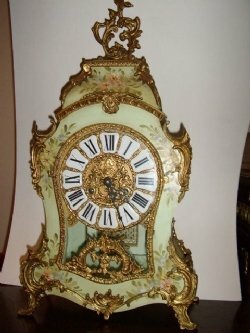 A fabulous copy of an early 18th century French Louis Style Bracket Clock with hand painted decoration inside and throughout the outside of the case, with porcelain roman numerals. 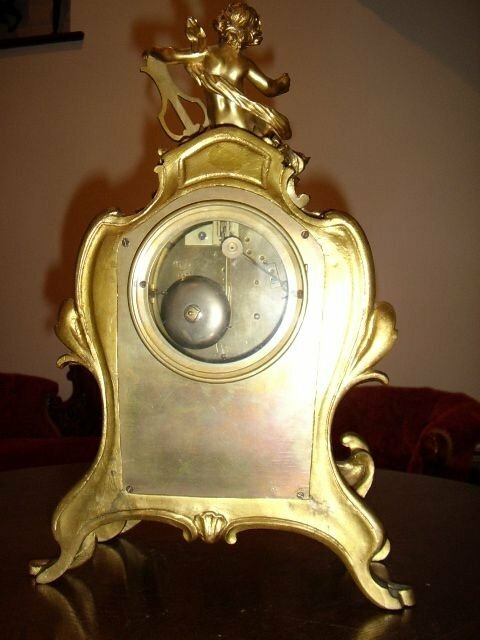 The diameter of the clock face is 6 1/2 Inches with the centre chaised in deoration. 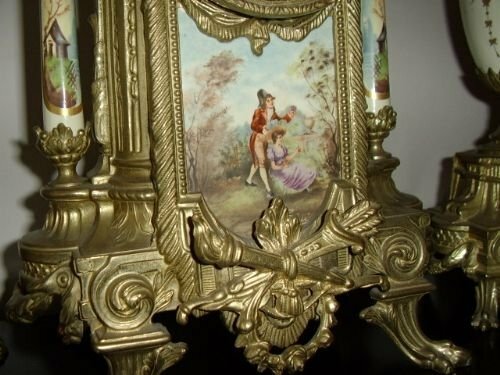 This example is accurate and detailed and has fabulous ormolu mounts throughout.The main case is of wood construction. The movement is a comprehensive model which chimes with two separate bells ringing in sequence. 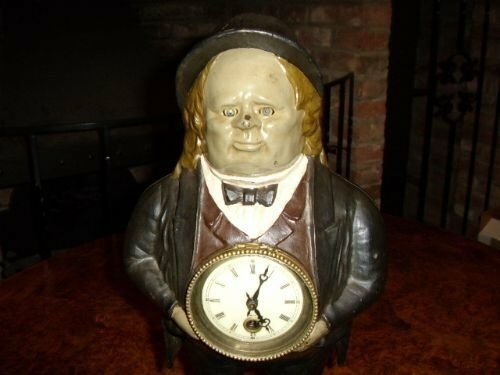 The clock is an eight day winder which chimes on the half hour and hour. 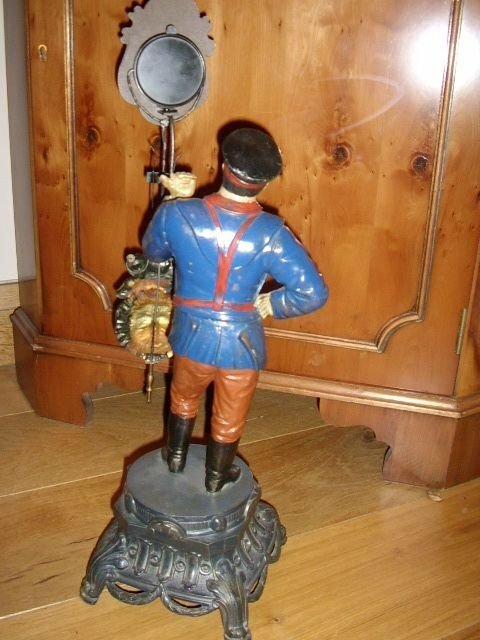 All round excellent condition with no damage and age wise is about 50 years old. The Measurements are Height 23 Inches x 12 Inches in Width and 6 Inches in Depth. 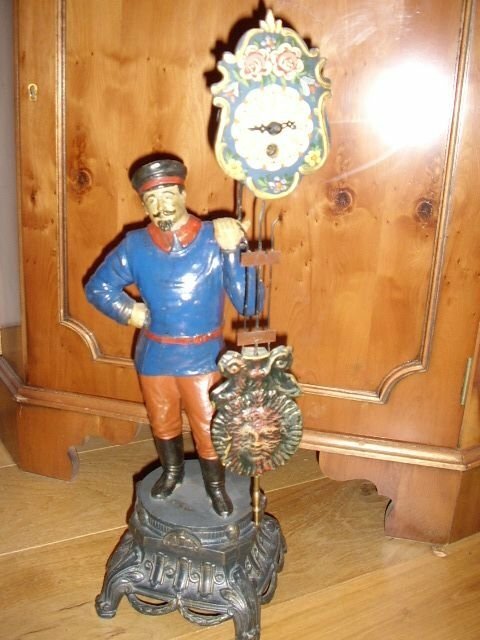 NOVALTY CAST METAL PAINTED FIGURINE CLOCK WITH MOVING EYES STAMPED UNDERNEATH BRADLEY & HUBBARD. 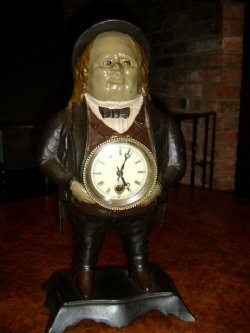 A humerous novalty cast metal painted figurine clock,depicting an old man wearing a bowler hat and holding the clock face,which has moving eyes when wound. 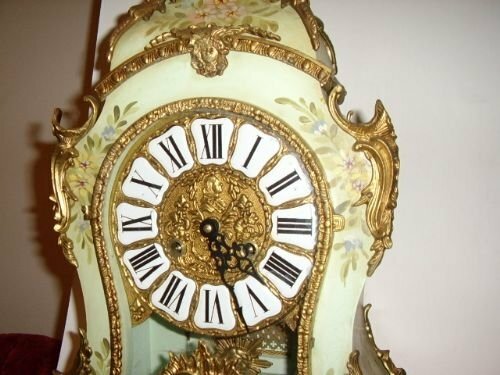 The condition is very good and has not been repainted,having a porcelain roman numeral painted face with glass & brass cover. 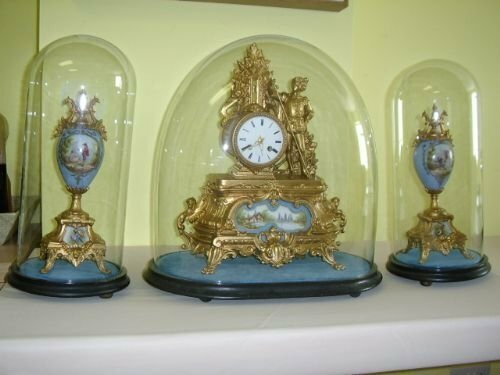 These novalty clocks were made by a company called 'Bradley & Hubbard',who first patented them back on 14th July 1857. This information is stamped in relief on the underside of the casting. A nice example of a painted sphelter antique figurine clock which would have originally been produced purely as a novalty piece. This figurine clock has a tiny key to wing the swinging wooden clock face,and will run for 4-5 days at a time. The whole clock face swings by means of a counter balancing pressed sunburst pendulum at the other end of a triple wire shaft. 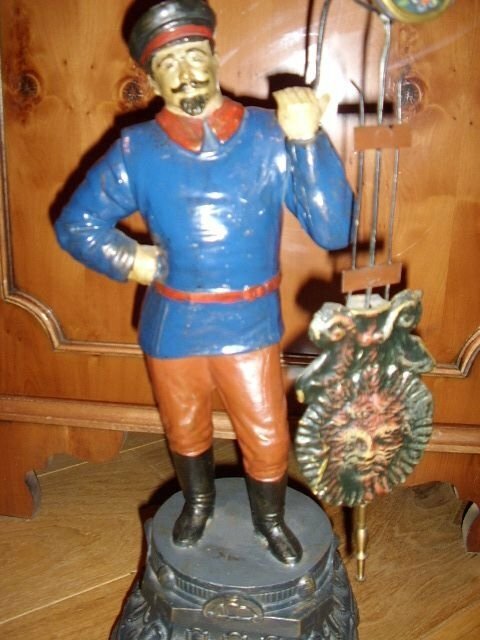 This entire unit itself just balances on two hidden tiny pins fastened to a small strip of steel in the mans hand. A real collectors item which is in good condition,having still retained all the original painted finish,with no damage visable. The base is a pressed /cast strong metal constructionwith etail in the design. Measurements are 20 1/2 Inches in Height x 6 1/2 Inches Squarefrom the base.